Technology is only one aspect of the Carolinas Aviation Museum in Charlotte, N.C. Each exhibit is showcased with information and stories on aviation history. CHARLOTTE, N.C. — One of the most heroic events of the past decade to fully capture the public imagination was the 2009 “Miracle on the Hudson” Flight 1549. En route from New York’s LaGuardia Airport to Charlotte, N.C., the Airbus lost power to both engines after striking a flock of geese. Piloted by Captain Chesley “Sully” Sullenberger, it landed nearly intact in the Hudson River with no loss of life. Recently, the US Airways plane landed in a considerably safer spot as its final resting place: Carolinas Aviation Museum just around the corner from Charlotte International Airport. The aircraft forms the centerpiece of the museum’s collection of military and commercial aircraft, helicopters, equipment, and artifacts, which document milestones in aviation history back to the time of the Wright Brothers. When you first enter the museum’s vast hangar, you barely see the giant Airbus. Instead you see Wilbur Wright’s prophetic words “Flight is possible to man,” written beneath a full-scale replica of one of the Wright Brothers’ earliest aircraft. But round the corner and the Airbus comes into full view, amazingly intact but pockmarked by gouges and sporting cracked windows and partially shredded wings. Visitors can walk around the plane, which is parked at the angle in which it hit the icy waters of the Hudson. Dappled floor lighting suggests the moving tide, and you can sit in an evacuation slide identical to the one that became a life raft for some of the passengers. A glass case exhibits artifacts from the plane, including crew uniforms. Behind the plane, visitors can sit and watch the powerful documentary film of the event and its aftermath, which runs on a loop. Of the 155 occupants on board the flight, 80 were from the Charlotte area, and director Wally Coppinger says some of them stop by occasionally for a “meet and greet” to tell their stories. “The Miracle on the Hudson” exhibit has put the museum on the map. But it is just one facet of this family-friendly museum, which dates to 1937. It expanded three years ago, moving to a former Wachovia Bank hangar of 40,000 square feet that allows for showcasing not just the Flight 1549 Airbus but a wide variety of aircraft, from the Wright Flyer and an early flight simulator from 1929 to a Stearman biplane and an Ercoupe with cloth wings designed to be flown without pedals. Coppinger says that since the move, the museum has changed in scope and attendance has tripled. 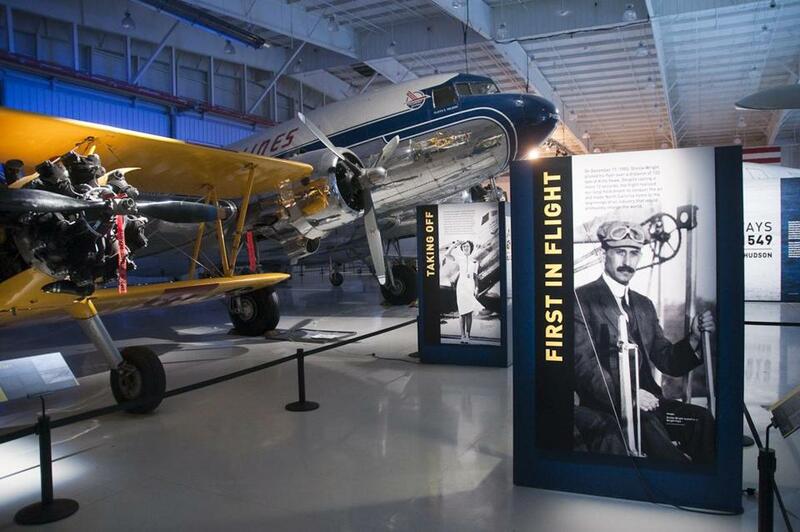 Designed by Steven Wright, it is now affiliated with the Smithsonian Institution and has a gallery feel, with plaques that give context to an aircraft’s history and use. An interactive wall exhibit teaches the basics of flight next to a Cessna in which students can sit and explore the controls. We sat in the cockpit of a WWII fighter jet and learned all about its controls and the history of its military function from a knowledgeable volunteer. In fact, throughout the museum, friendly docents were very informative regarding some of the sophisticated technology on display.